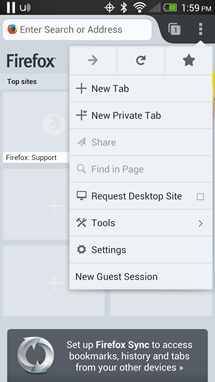 The release of Firefox 57 'Quantum' last year included several major changes to the browser's structure, including a new CSS engine known as Quantum CSS (formerly called 'Stylo'). Simply put, Quantum CSS is the browser component that figures out what styles should be applied to what elements. Because modern sites often use thousands of lines of CSS with many overriding styles, the feature was designed to take advantage of multiple CPU cores, giving Firefox 57 a performance boost over previous versions. 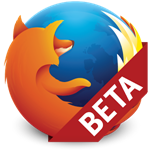 Shortly after Firefox 46 went stable, the beta for version 47 is now available. As is typical for browser updates, the changes are minor and eclectic, but a few this time around can decrease the amount of mobile data you consume by a hair or two. 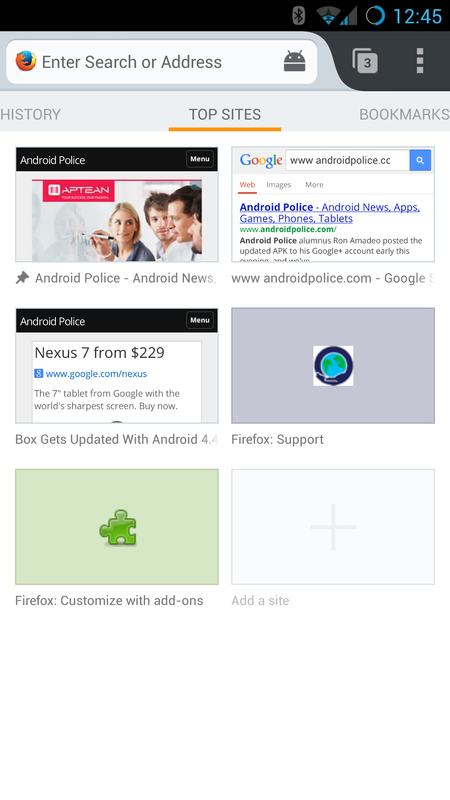 Much like Chrome releases, Mozilla's updates for Firefox are rarely mindblowing. Instead, we get a constant stream of smaller changes that slowly but surely upgrade all aspects of the user experience. 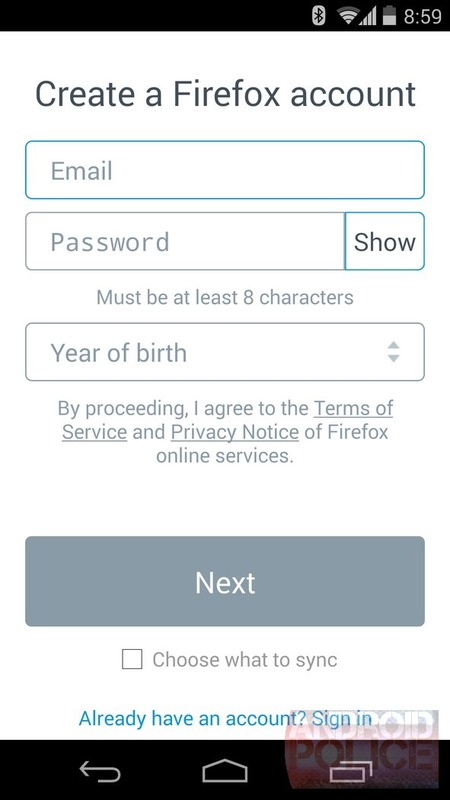 The latest beta release for Firefox, v46, falls right in line with this pattern. The highlight of the update is that the browser will display recently visited webpages even when you are offline, using data stored in cache. You don't need to do anything in particular to get the offline webpage feature going; if Firefox has it cached, it will display instead of the typical error messages you get when trying to browse offline. Mozilla, keeping pace with their regular rapid release schedule, released an update for Firefox Beta today. v39 graduated to stable, sending v40 to the beta channel. With some focus on changes to the desktop version, there aren't major user-facing changes in this Android update. Still, there should be some performance enhancements along with a nice UI improvement for navigating forward and backwards through a tab's history. 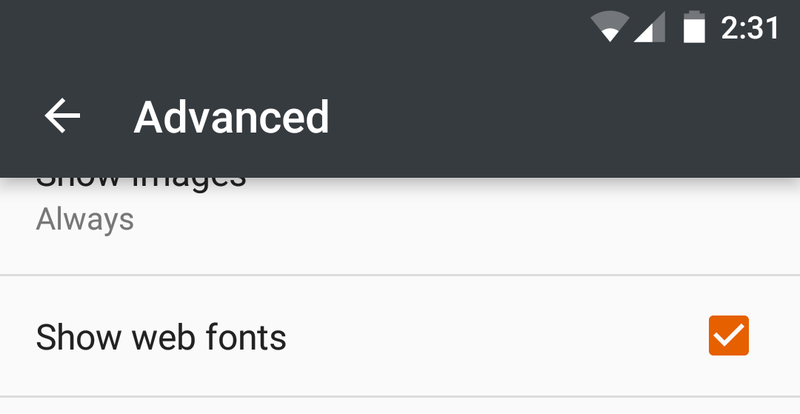 The overflow menu has been home to the forward and back shortcuts for quite a while now, but there wasn't an efficient way to navigate by several pages. 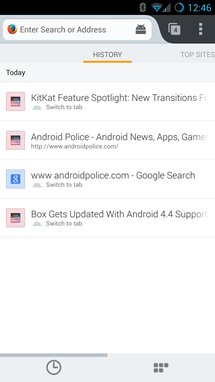 Starting with v40, pressing and holding on the forward or back arrow will bring up a list view of your history. 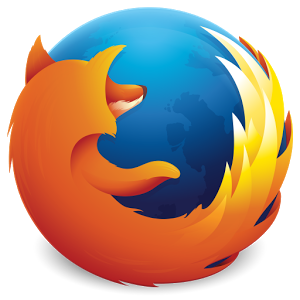 It may have become the underdog now compared to the ubiquity of Chrome, but Firefox isn't letting that excuse hinder its improvement and development. 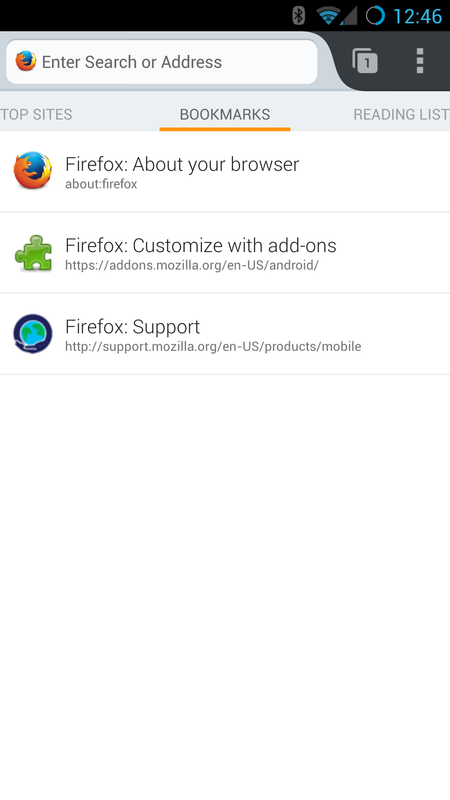 The latest beta of Firefox for Android proves that by fixing some issues, adding support for requested regional features, and enhancing performance thanks to a few HTML5 additions. Most notable are the srcset attribute and <picture> element support in HTML5. These allow web developers to point to various sizes of the same image that load based on the device you are browsing on. When used appropriately, the <picture> syntax only downloads the image for its specific context (screen resolution, size, orientation), and hence leads to more responsive page loading. 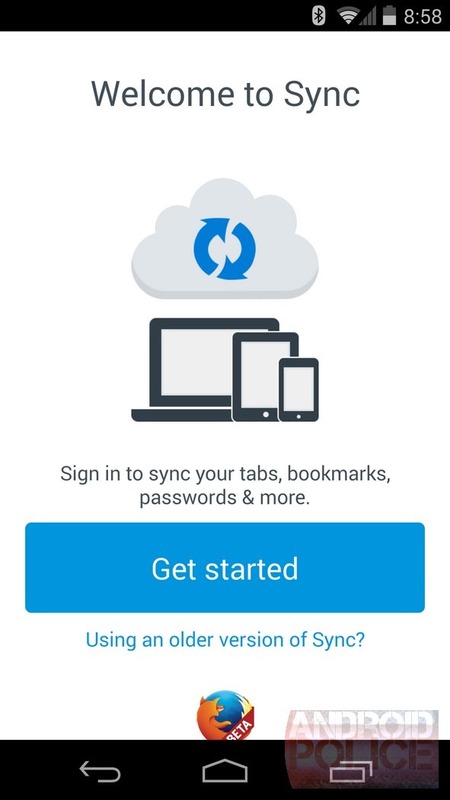 Earlier this year, Mozilla introduced Firefox Accounts, an easier way to sync all the good stuff like your passwords, bookmarks, history, and open tabs across multiple devices. This is far from Firefox's first rodeo, as the browser has had support for syncing data since Chrome was a baby, but this introduces in a further degree of ease-of-use and consolidation that users have come to expect. Now the functionality has found its way into the latest version of the Firefox Beta Android app. 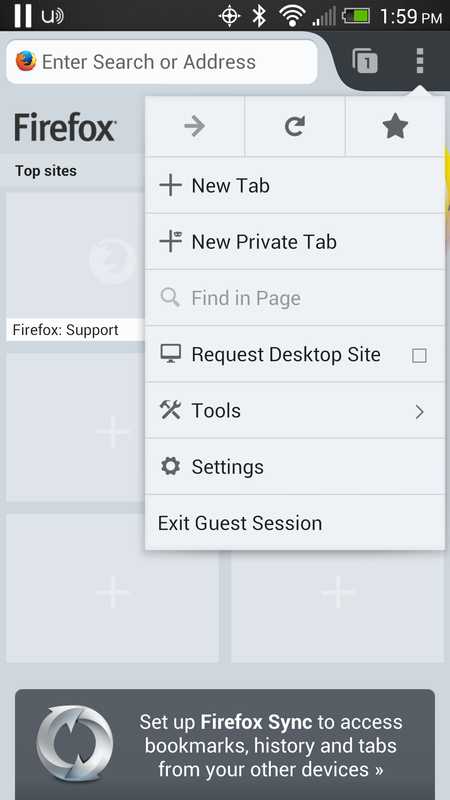 A prompt to turn on the feature appears at the bottom of the new tab screen the first time you fire up the app. 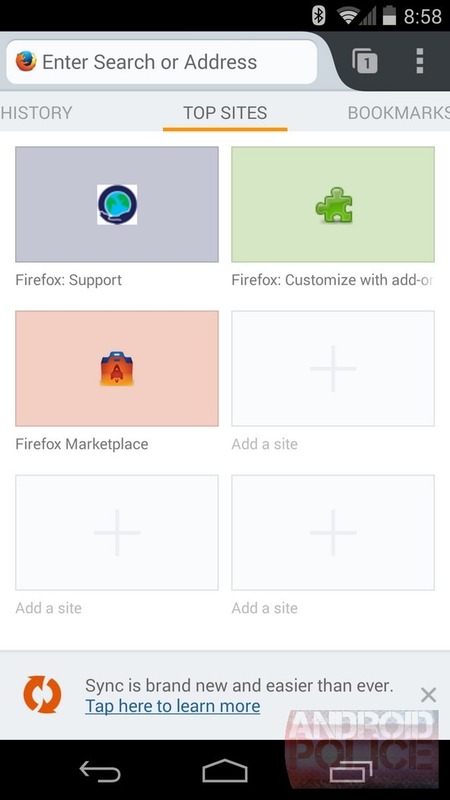 The latest version of the Firefox Beta has hit the Play Store, and it introduces a change to the new tab page that is sure to liven up your mobile browsing experience. As usual, top sites are presented as thumbnails on the default screen, but version 26 makes your history, bookmarks, and reading list all accessible with just a few swipes. 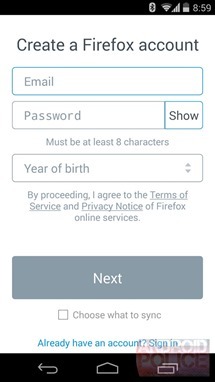 It's an intuitive and attractive experience that easily trumps that offered in the stable version of the browser. 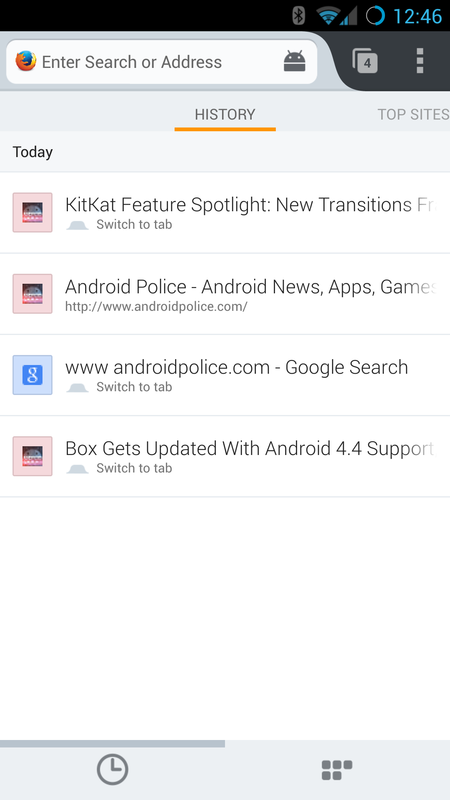 The update also introduces a new way to pin tabs to the home page, performances improvements on some NVIDIA devices, and, of course, bug fixes. 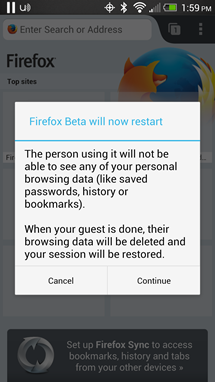 Firefox Beta users, listen up. It's time to whip out your phone and check for updates. 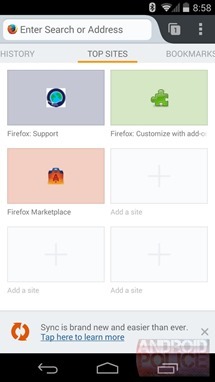 The slightly less stable version of Mozilla's mobile browser has made the leap to version 25, and it's picked up a few new features along the way. 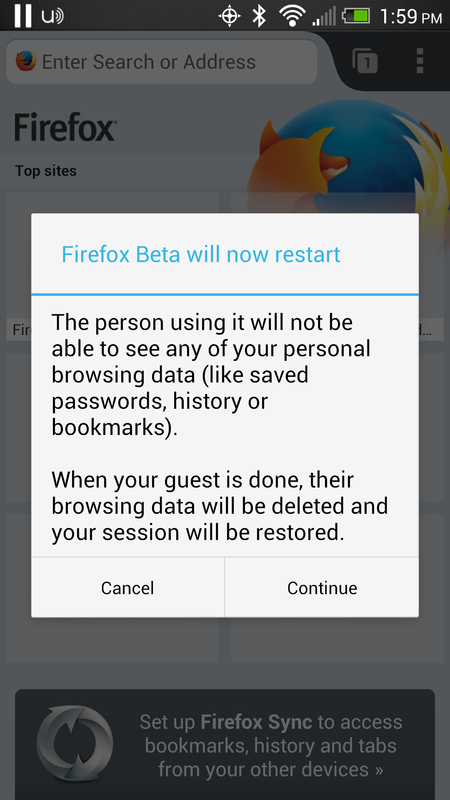 The most visible new feature is a new guest browsing mode that lets you safely hand the phone over to grandma without her getting a closer look at your browsing history than either of you ever wanted. Mozilla's also rolled out mixed content blocking aimed at protecting users from man-in-the-middle attacks and unwanted eavesdroppers. On a less threatening note, add-ons can now add indicators to the URL bar.